NY: Princeton University Press, 2009, 232 pp. ISBN: 978-1-4008-3033-6 [Paper $14.95 US]. Primatologist Frans de Waal was included in “Time Magazine’s” 2007 list of the World 100 Most Influential People—a profoundly correct choice. Through many years of skepticism and criticism from within his academic community, de Waal patiently persisted in letting his subjects reveal themselves to him rather than imposing preconceptions of dominance or aggression or brute nature on them. 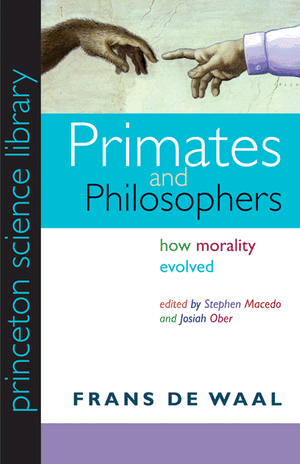 Primates and Philosophers: the Evolution of Morality is a remarkable result, and its subject—the origins of human morality—is a profoundly important one. Using the data from his years of research, working primarily with captive chimpanzees and capuchin monkeys, de Waal convincingly reveals their capacities for a sense of fairness and for empathy. He builds the case for why a system of morality, however sophisticated, must include these features. He explains how the elaboration of morality in humans makes sense when it is viewed, not as some external overlay on a fundamentally brute nature, but as an evolutionary outgrowth of empathetic tendencies and a fairness sensibility present in human primate ancestors. He makes the case that we evolved from a deep primate past in which animals often care for the weak and build cooperative coalitions by reciprocal transactions. Following the section written by de Waal, the book presents responses by four other students of human morality: Peter Singer, Christine M. Korsgaard, Philip Kitcher and science writer Robert Wright. These responses give this book a tremendous breadth. 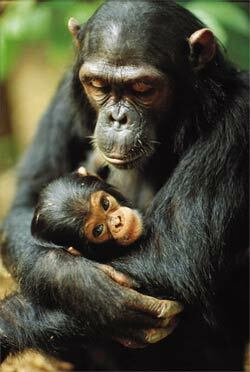 Primates and Philosophers is a must-read by anyone seriously interested in human nature. My single quibble has to do with the place of women in the moral picture. In my own work, I am interested in the role that women, and our primate female ancestors, have played in the evolution of morality—most specifically with respect to an aspect of our dark side, viz. physical aggression and war (Hand 2003, 2005, 2006). ) Anyone looking for a discussion of how women fit into this moral discussion will be disappointed. 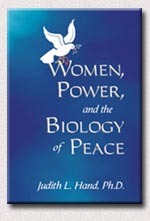 Like the vast majority of authors, de Waal has a tendency to lump women into the category of humans or humanity or mankind so that any aspect of women’s natures that may differ from those of men, including their responses to social conflicts, are unclear—in fact, are hidden (see Hand 2003, pp. 114-121, 124). Primates and Philosophers, for example, has no index entry for women. That quibble aside, I not only recommend this book, I praise it for its clarity of writing, clarity of thought, and for casting illumination on positive aspects of our deep human past. My other interest is in war and whether or not we could end that barbaric behavior if we choose to. If humans are not essentially brutes struggling to keep their darker side in check but rather are innately moral creatures, operating fundamentally out of a sense of fairness and the capacity for empathy, it bodes well for any movement that would seek to abolish war. Hand J (2005) A Future Without War. org (Available from: http://www.afww.org (accessed 26 February 2010).